If you are lucky, you live in an area where you can buy locally produced flour. I can actually go to our regular grocery store and buy flour that is produced in our state. 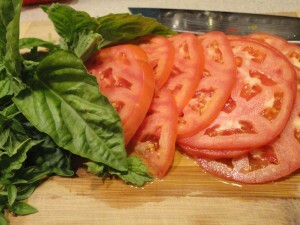 Add fresh tomatoes, basil, and even homemade cheese and you have a localvore dream. This is a labor of love but well worth it. Step 1: Make the cheese. I praised the 30 Minute Mozzarella kits from Ricki the Cheese Queen on a previous post about a year ago. I hadn’t made cheese in a LONG time so I thought it was time to break out the supplies. 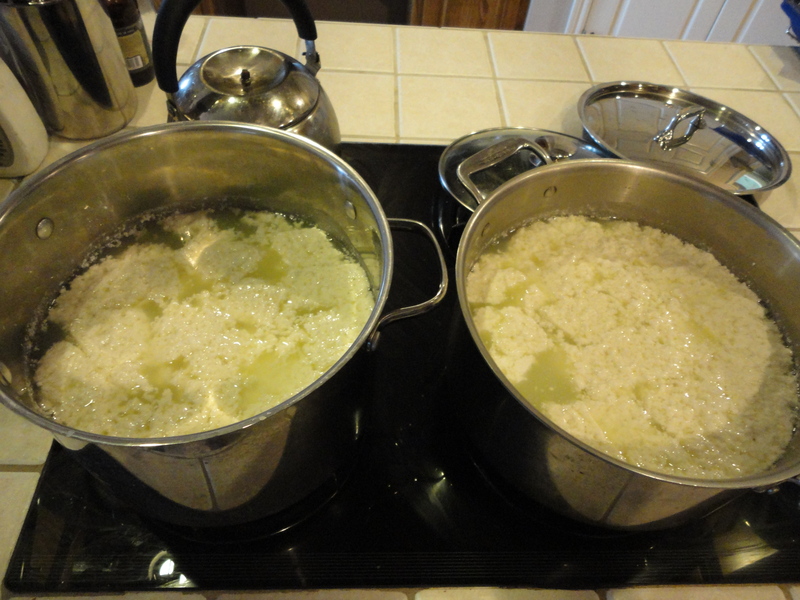 This time, I decided to make two batches at once. 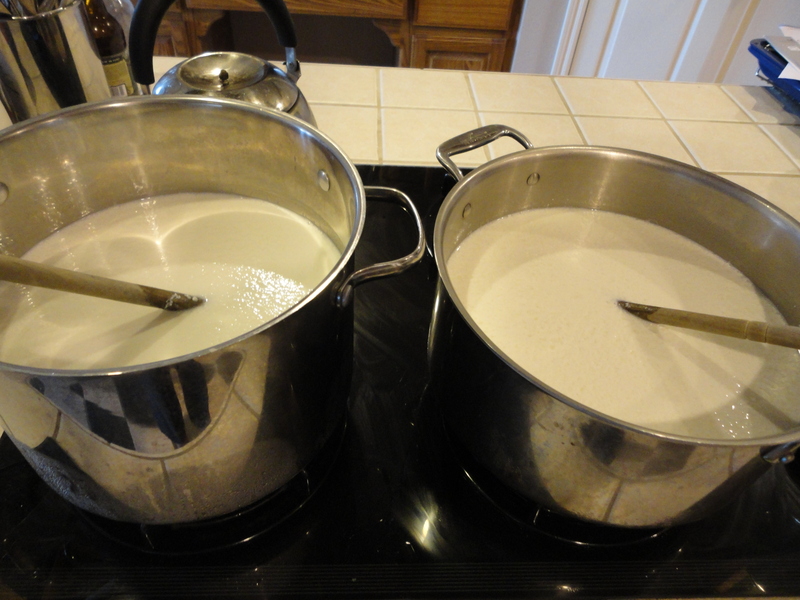 Two gallons of milk, two large stock pots, and a unreasonable idea to make two batches at once. The citric acid has been added. 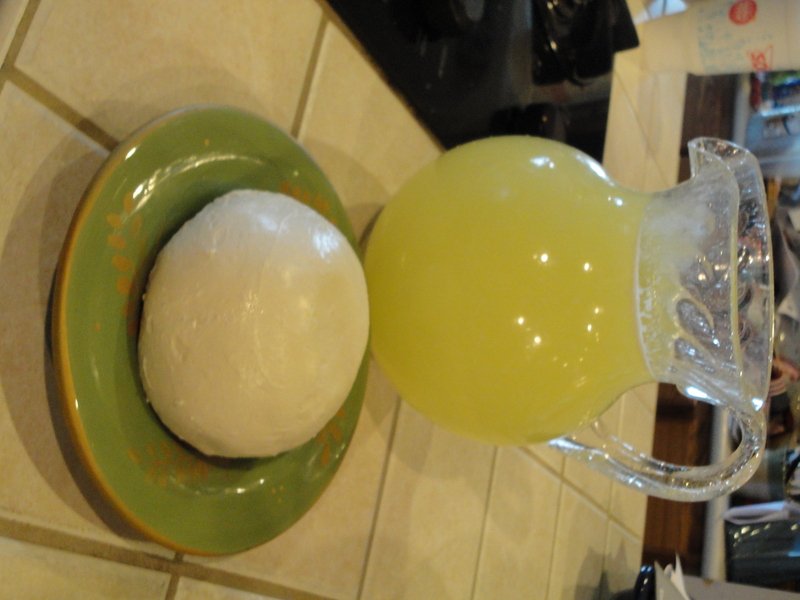 Making cheese is relatively easy, but I have not been able to make an actual 30-Minute Mozzarella. And, I definitely didn’t this time. What was I thinking? Basically, you take a gallon of milk, add citric acid and heat to 90 degrees. Then you add the rennet and stir up and down for about 30 seconds. After that, you just cover the pot and let it set for 5-10 minutes. 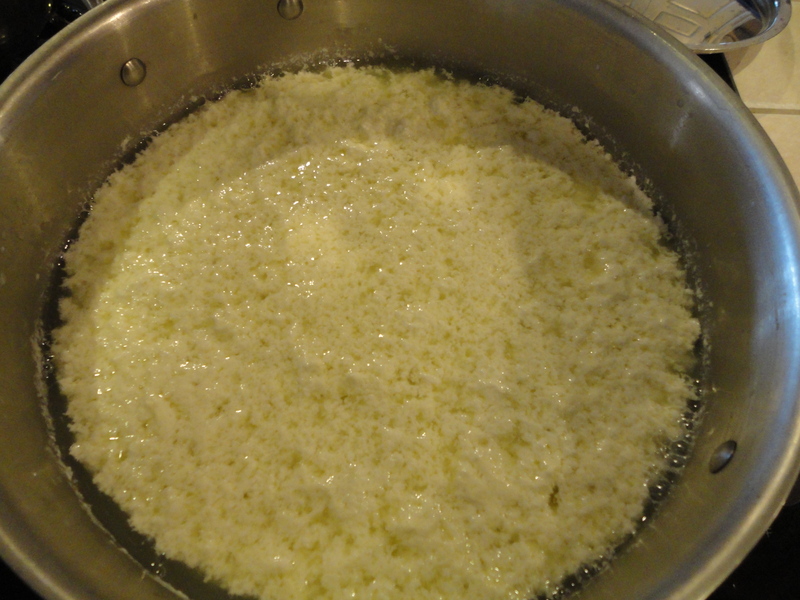 Check after 5 minutes to see if the curd has set up and it resembles a custard. This is what it looks like in its "custard like" state. 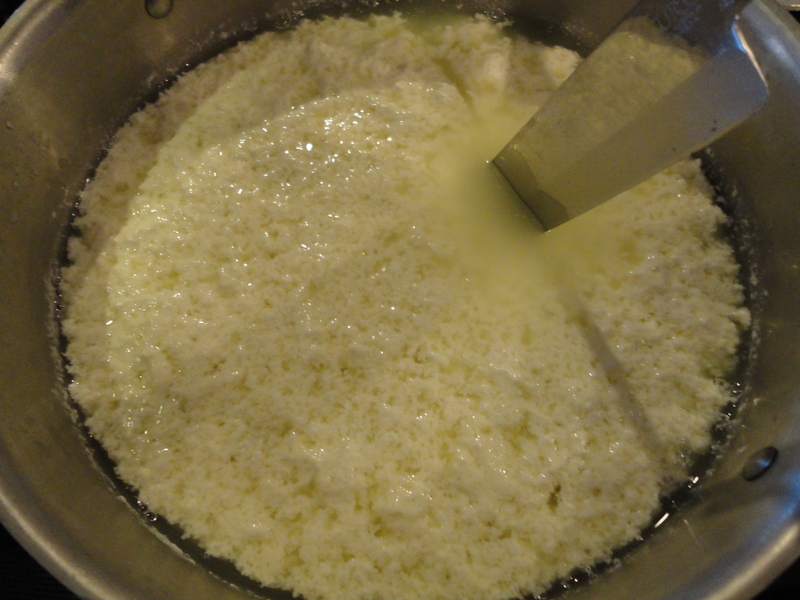 Then, you will need to cut the curd into cubes. 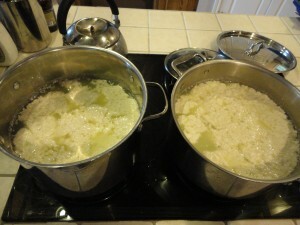 My two batches, curds cut, and ready to heat and stir. After it is heated this last time, take off the heat and slowly stir for 2-5 minutes. Strain off the whey (and set aside) and I highly recommend using the microwave method from here on, not the water bath method. I had used the water bath method many times, but since I was making two batches at once, I decided to use the directions for the microwave. Much easier and I will use it from now on. Basically, after the curds are heated, you stir and stretch until you have a beautiful glossy ball of mozzarella. (My water-bath method cheese did not work this time. I did not have a nice glossy ball of cheese, I had a melted mess. I added some black pepper and have a cream cheese dip!) You must order a kit from Ricki for the supplies and detailed instructions. 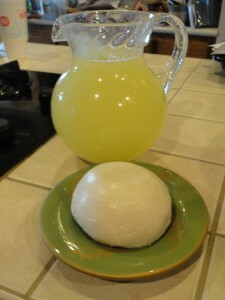 That is not lemonade behind the mozzarella; it is whey. Step 2: Make the crust. I learned a great tip from Ricki when I got the cheese kit—use whey to make bread. This is her recipe. She also has a fabulous Italian Bread Recipe that uses whey that comes with the kit. In the bowl of a stand mixer, combine 2 cups of flour, yeast and salt. Whisk to combine. Using the dough hook attachment, carefully add whey and olive oil. Stir in enough of the remaining flour to make a soft dough. Knead with dough hook and keep adding flour until a ball is formed (about 5 minutes). 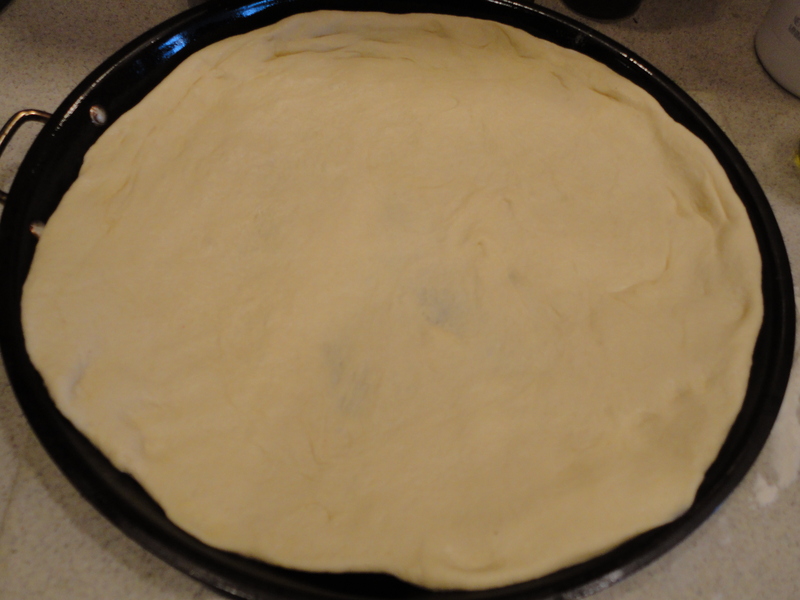 Place dough in an oiled bowl, cover with a clean cloth, and let rest 10 minutes. Press the dough on an oiled pizza pan. This dough is enough for one thick crust pizza or two thinner crusts. If only making one pizza, freeze the other half for later. This is an easy dough to work with. Fresh tomatoes (from the farmers market) and fresh basil from MY herb garden. 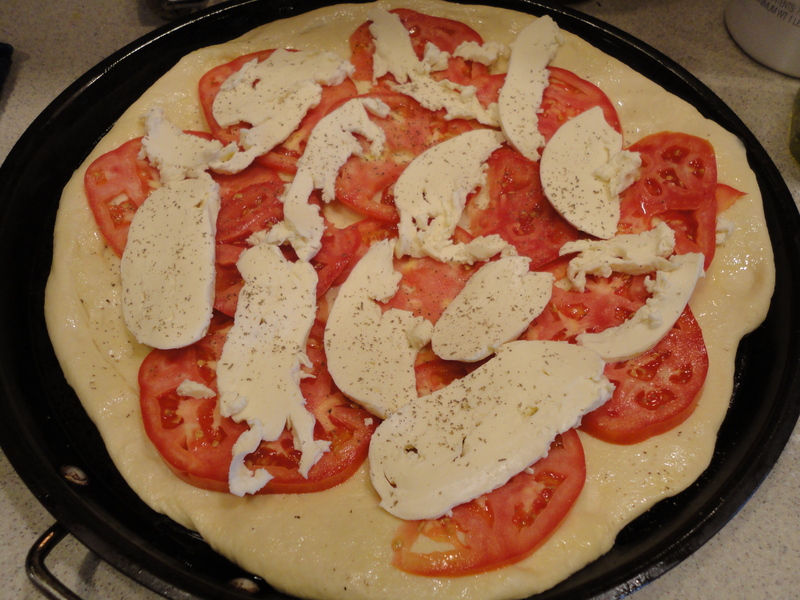 Layer the tomatoes onto the pizza dough. Sprinkle garlic over tomatoes. (I just pulled about 50 heads of garlic—alas, no tomatoes.) Drizzle olive oil over this and lay on mozzarella slices. Season with fresh ground pepper. 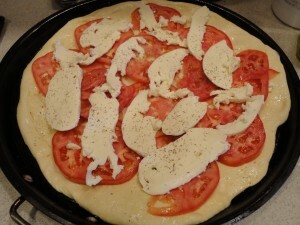 Bake for 8-10 minutes or until crust is golden brown and cheese begins to bubble. When out of oven, sprinkle basil on top and let sit 5 minutes. I hope you are not intimidated by these many steps. Obviously, cheese can be made before hand as can dough. (Just refrigerate dough if making a day early.) At least we didn’t go as far as to make our own charcuterie for a topping! I also pride myself in a lasagna from scratch with this marvelous cheese as well. I never even noticed if we have local flour. One of those things I never looked for but definitely will now. 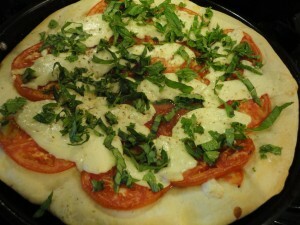 The pizza looks delish!